Even if it’s the beginning of the year and we all make resolutions and detox, there’s still room in my house for a delicious cheesecake. So this is one that will really take very little time to make and it’s quite extraordinarily yummy. Try it and let me know how it tastes! Line with baking paper and beans/weights. Bake for 15-20 minutes. Then remove the paper and weights and bake for a further 8-10 minutes. Reduce oven to 160°C (350°F). Process the cream cheese, cream, eggs, sugar and vanilla in a food processor for 1 minute until combined. Pour over the base. Bake for ½ an hour. Spoon the berries over the top. Bake for another hour or until filling is almost set. Turn off oven and leave in oven for 30 minutes. Remove and when cool, either refrigerate or leave out to cool and serve at room temperature. 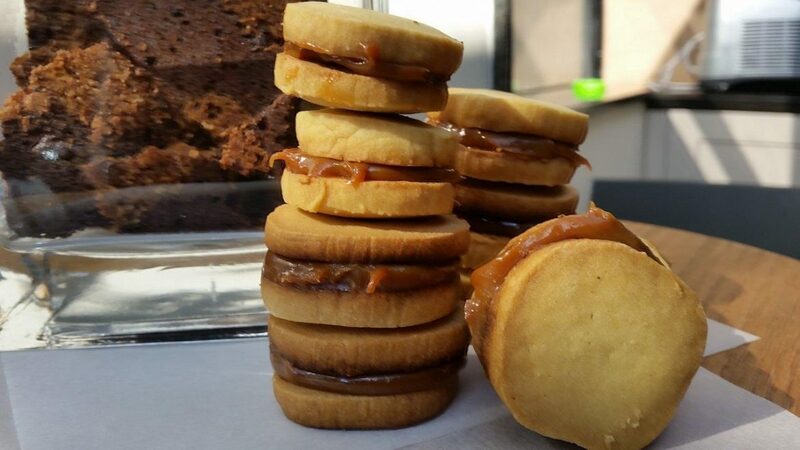 There’s something about the crunch of a shortbread biscuit mixed with some decadent dulce de leche (aka caramel toffee sauce) that makes you want to eat the whole lot of them. If you have trouble finding the ddl (dulce de leche) then substitute Nutella or something equally rich and full of calories! Place the butter, icing sugar and vanilla in a Mixmaster and beat until pale and creamy in colour with a K beater. Add the flour and maizena and continue beating until a smooth dough forms. Place the dough onto a sheet of plastic wrap and roll it out into a log, sealing the ends of the plastic wrap. Place the log in the fridge to become firm, about 30 minutes. Preheat oven to 180°C (375°F). Prepare a baking tray with baking paper or a liner. Slice the dough into about 1cm (½ inch) thick slices and place onto the baking tray and bake for about 10-12 minutes, or until biscuits are golden. Remove from oven and place on a cooling rack. Once biscuits are completely cooled, spread half the biscuits with the dulce de leche using a palette knife. Then sandwich with the remaining biscuits. Leave to rest on a lined tray until the dulce has firmed. Then pack into a Tupperware until ready to use. Heat the castor sugar in a large frying pan. Swirl the pan all the time until it turns golden. When it is completely clear and very golden, add the cream, stirring all the time. Be careful that it doesn’t splatter and that there are no lumps. Keep stirring until all the lumps disappear. Cool completely and then sprinkle with salt when ready to use. As I looked out of the window today onto my summer garden, I thought “What better way to celebrate summer than with the most outrageously delicious mangoes”. 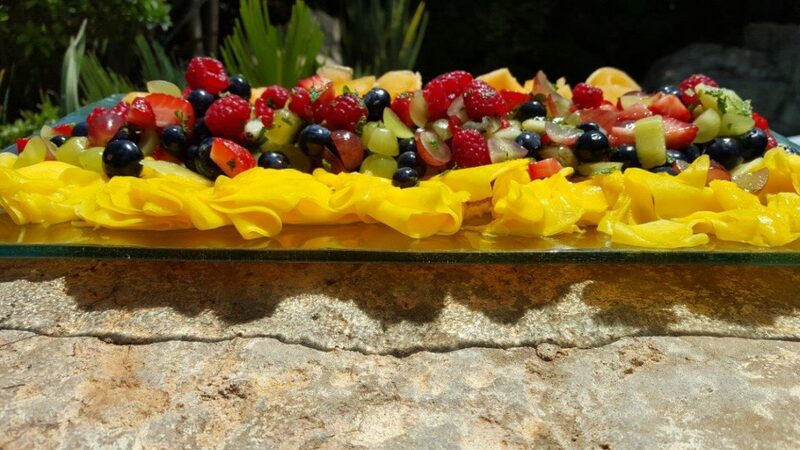 So here is my take on the freshest of fresh summer fruit platters. Slice the mangoes paper thin and lay on a platter. In a separate bowl, dice the strawberries and grapes, and mix with the berries and pomegranates. Add the granadilla, mint and sugar. Toss together. About 1 hour before serving, spoon salsa over the mangoes. Serve very cold. 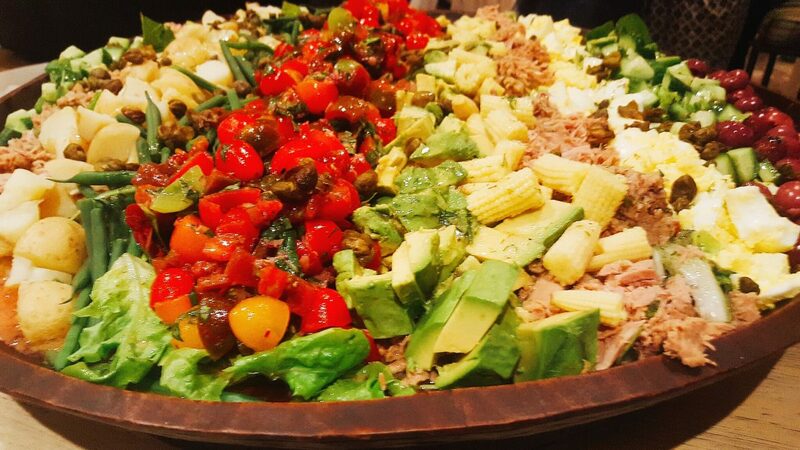 This is the perfect salad to wow guests with. Serve it to them as a fresh lunch meal, or just treat yourself. Instead of just dicing tomatoes, I marinate them in this fabulous dressing and then place them on top of the salad. The secret is that the tomato salad on its own is quite something. So here are 2 salads in one! Boil a pot of water with some salt. When boiling, blanch the beans whole for 4 minutes, then dry well and cut half. Blanch corn whole for 3 minutes, dry well and cut into pieces. (can be done day before). Place them immediately into ice water until they are cold and dry well. Then keep in the fridge in a tupperware. Heat about ½ cup grapeseed oil in a small pot until smoky. Drain the capers and dry very well. Place small amounts in the hot oil for a few seconds until they burst open. Drain on paper towel. Continue until all the capers have been fried. Blend with stick blender. Set aside for drizzling over the salad. Halve or slice the tomatoes, finely grate the red onion on the julienne blade of the mandoline and chop the basil. Toss everything in a bowl with the dressing to coat. Set aside. Leave to marinate for about ½ an hour. Whisk together and pour over tomatoes. 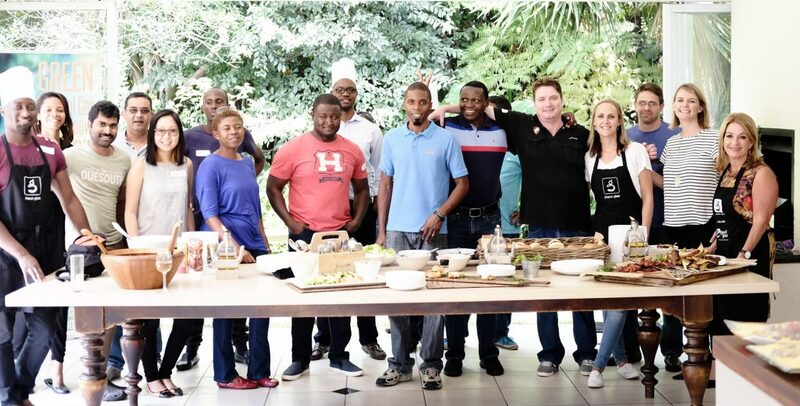 TO SERVE: Arrange everything in rows on a platter with the tomatoes in the centre row. Drizzle with dressing. Top with the micro leaves and sprinkle with the capers. 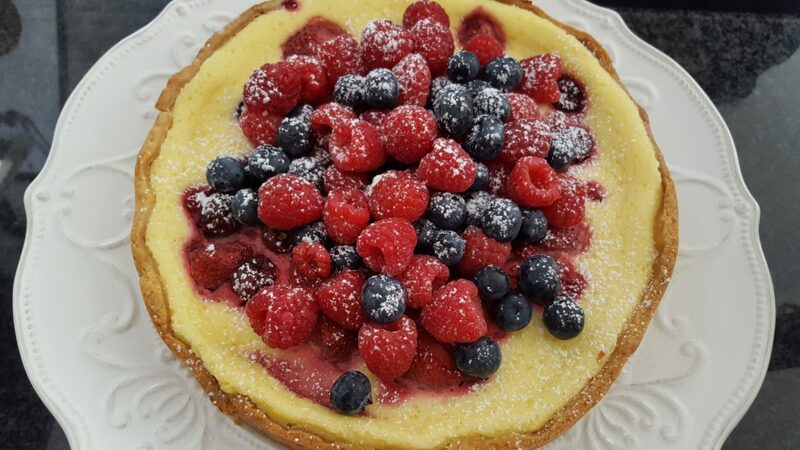 When you are looking for a quick and easy dessert to wow your guests, this is it! Look no further than your nearest store to find the nicest tasting chocolate chip cookie mix. Top it with this easy one step ice cream. And voila! Beat the cream and the condensed milk together until thick and stiff. Dissolve the coffee in the warm water and add to the mixture. Gently whisk in until completely mixed through. Set in freezer until ready to serve. Follow directions on the packaging. Spread onto a lined baking tray in 1 large round cookie. Do not spread too thin. Bake just until the biscuit is set, it must be slightly soft in the centre. Remove from oven and cool. 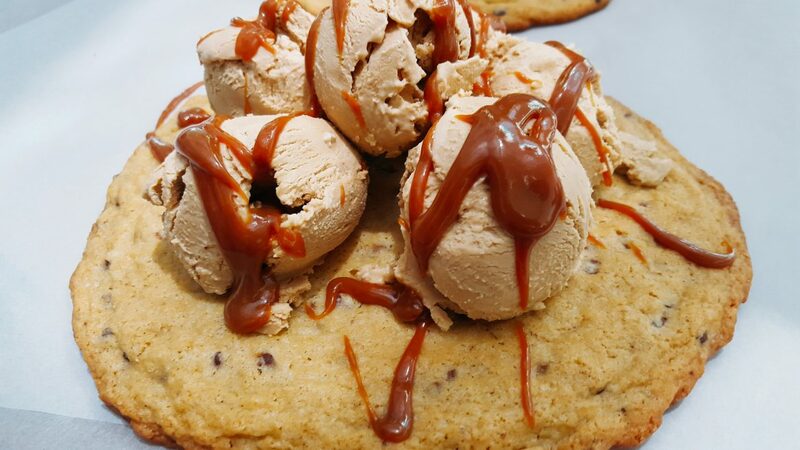 TO SERVE: Place balls of ice cream on top of the cookie and drizzle with either a chocolate or caramel sauce.